7 - 10 working days for MOQ. (1). Classic digital 2.4G device with frequency hopping technology,high anti - interference features from and to other else wireless devices,such as Wi - Fi. (2). With a high resolution of the monitor 800 x 480 pixels to help you see more clearly of the monitoring objects. (3). Support 1 camera,or 2 cameras,or 3 cameras, or at most 4 cameras for monitoring at the same time on the screen, 4 CH 4 image will be shown on the screen. (4). Main processing IC from Korea,it is a premium IC in the whole market,you will not feel delay pictures on the screen,for 4-image,4-channel,the picture ( video ) speed is 10 frames per second,if 1 - image,1 - channel,the picture processing speed is 30 frame per second. (5). In the aspects of privacy protection : digital modulation is better than analogue modulation not only on its strong interference resistance but also on its encryted transmission data. any one can easily receive and check the video from analogue modulated transmitter ( here refers to the cameras ),but they can't see the video that was transmitted from digital modulated transmitter.data encryption become necessary for more safety applications. (6). Adopt 850nm for the IR LED,totally 24 pcs,which kind of LED is widely used on professional CCTV camera,to assure supervisor also can see the objects in the night within about 10 meters far from the camera. (7). Exclusive factory that provides high sensitive micro-phone built-in the camera,you can see the picture and hear the sound now,the data also can be recorded in your SD ( or TF ) card. (8). With the bracket matched for the camera,all end users can install the camera ealily for all places. (9). 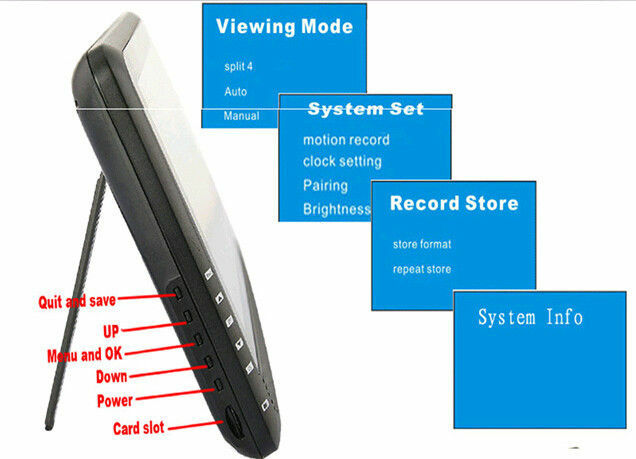 Recording will act only when you insert an SD ( or TF ) cards to the monitor, support maximum storage is 32GB, now 4 cams,4 CH's video will overwrite on the SD card which can be played on your cell phone. (10). Manual recording,scheduled recording and motion detection activated recording are optional. (11). Metal shells ( Mg - Al alloy ),weatherproof design.with an Max 17dBm antenna,you can monitor your place around 100 - 300 square meters area. here 300 meters is in line of sight without obstacles,check the signal bar on the image to adjust your monitoring distance. (12). All systems meet DIY concept,Pnp (plug&play) operation,easy and convenient to use. (13).The adapter can be used by 7/24,be sure to use the adapter matched with the systems. commercial buildings,model rooms, property brokers. cafes, Internet bars, beauty shops, golf course,or personal use. 1. How to add extra camera to the system with 2 cameras now? If you buy 2 cameras with monitor as one set, sometimes you want to add extra camera to the system, be sure to buy the same camera from the same factory, otherwise it will not work. Read user manual before operation for " pairing " , when gets in the menu of pairing, press “pairing” on the screen, meanwhile press the button on the connector of the camera, you can see the video from the camera immediately. 2. Why can’t I listen to the sound ? You can’t listen any sound when in quad image monitoring,you need to choose certain channel to hear the sound from camera,be sure the sound of camera is not mute. 3. Will all the recorded audio video be lose when the power is off unexpected? Before recording,we recommend to choose segment recording mode in the option of Motion Rec. 5s or 10s for every recording segment,so when the power off, you will lose very few data. 4. Can I use other adapter for the system? 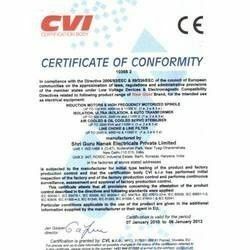 Not recommended.The adapters included with the system are customized to meet 7/24 time’s working after strict quality test and aging test, safety and reliable to system and people. 5. Do you accept small orders like 5pcs, 10pcs or drop shipping? Yes, no problem. We keep stock for about 50 sets for each model, which can be as samples for customers or for small orders. the unit price will be also competitive in small order or drop shipping. 6. Can you accept OEM or ODM order? For more question,please contact with us freely at sales@seepower.cc. 1. The boss is a senior engineer from Foxconn.also the CEO. 2.Engineer team composed by experienced software and hardware engineer for more than 5-8 years in this field. 3. Experienced sales are ready to answer your questions about consulting,sales service orders,technical support,etc. all of them with more than 3-5 years exporting experiences. 1.Follow the procedure of optimized scheme priority.before selling new product to the market,several schemes have to be filtered and only 1 scheme is settled and to start small volume production test. 3.To assure quality,main electronic parts and chip sets are imported from Taiwan,Korea, and USA. 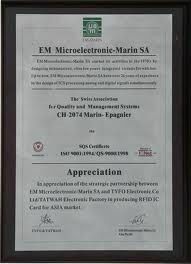 then adopts nearly 99.9% SMT technology,along with strict QC control. in this way,bring us lower defective rate, lower labor cost, shorter lead time,to achieve the aim of good quality in relatively lower cost. 4. Development & innovation is never stopped. not only to improve current products every year,but to upgrade to a new version of product as well. Master the trend,master the market. 1.Free training and consulting,quick response. 2. Always keep stock for fast delivery. 3. Low MOQ to meet different levels of customers. 4. Accept OEM,ODM from product function to packaging. 5. Limited quality warranty for 1 year,free exchange for defective product within 1 year (except human factors). 1. Insist on offering more cost - effective, stable, experienced & mature products for clients. To minimize & save the cost for some aspects including after - sale service. 2. Stick to the policy of clients utmost, quality first.We share this technological products with our clients to bring activation to their market and to help them keep competitive.